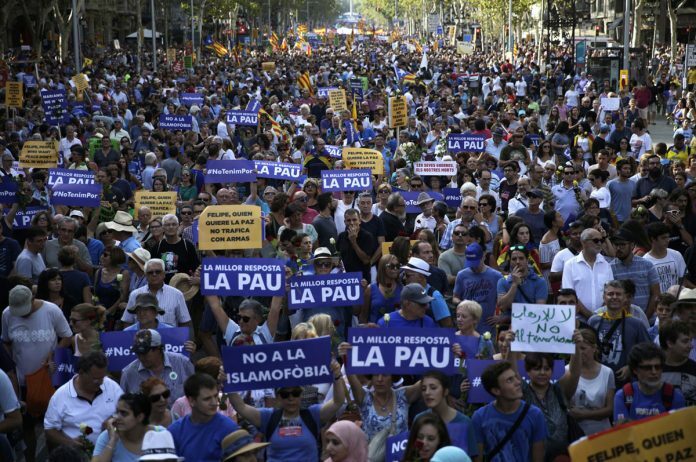 Hundreds of thousands of peace marchers flooded the heart of Barcelona on Saturday shouting “I’m not afraid” – a public rejection of violence following extremist attacks that killed 15 people, Spain’s deadliest in more than a decade. Emergency workers, taxis drivers, police and ordinary citizens who helped immediately after the attack on Aug. 17 in the city’s famed Las Ramblas boulevard led the march. They carried a street-wide banner with black capital letters reading “No Tinc Por,” which means “I’m not afraid” in the local Catalan language. The phrase has grown from a spontaneous civic answer to violence into a slogan that Spain’s entire political class has unanimously embraced. Spain’s central, regional and local authorities tried to send an image of unity Saturday by walking behind emergency workers, despite earlier criticism that national and regional authorities had not shared information about the attackers well enough with each other. Still, some citizens whistled their displeasure as authorities passed by and held banners criticizing the king’s role in promoting military exports to Saudi Arabia. Eight suspects are dead, two are jailed under preliminary charges and two more were freed by a judge but will remain under investigation. Thousands Barcelona March of Defiance Against Terrorism, shouting “I’m Not Afraid”. King Felipe VI led the demonstrators, alongside Prime Minister Mariano.